With a customer-centered focus, Primet Fluid Power utilizes products from leading suppliers in the fluid power, pneumatic, electromechanical, lubrication and process equipment industries to produce the very best in quality assemblies and systems. Browse our division’s website for more information about Primet Fluid Power. If you have any questions or would like to speak with a representative regarding our products and services, please e-mail us at primet@primetfluidpower.com or call us at (219) 844-4224. 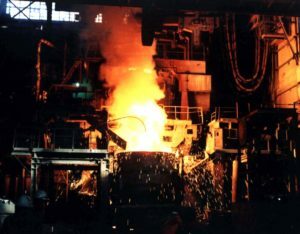 In the early 1980’s, the American steel industry was struggling to survive and many companies were forced to downsize their operations to remain competitive. Most maintenance was being outsourced which created a unique opportunity for businesses who had the knowledge and skill to repair the technical hydraulic and pneumatic systems required for steel production. William (Bill) J. Bestow recognized this opportunity and in 1983 opened Primet Fluid Power to serve the primary metal production industries. Educated as a mechanical engineer at The University of Illinois, Bill had worked in the steel industry for 20 years as a field engineer and salesman where he applied his knowledge of industrial maintenance and troubleshooting, helping to equip the industry with the cutting-edge technology necessary for steel production. He spent many years calling on the maintenance people working at the big steel industries in the Chicago and Northwestern Indiana areas helping to maintain and upgrade the equipment necessary for production. As time progressed, Primet became a well-known and trusted name in support to its customers, who valued the relationship and commitment they had with Bill and the rest of his staff as well as their expertise in solving problems and engineering new systems to meet the competitive demands of the industry. In 2003, Bill’s son, William D. Bestow (Bill D), took over for his father as President after having worked his way up in the company for 12 years. Bill D. started in the family business at the age of 14 cleaning and repairing components, then joined the company full time in 1991 after graduating college with a degree in Marketing and Finance from Illinois State University .Bill is now an International Fluid Power Society, certified Fluid Power Specialist . Today the steel industry is still at least 95% of Primet’s core business. Primet Fluid Power was officially acquired by Ritter Technology in February of 2017 and is now a division of Motion & Control Enterprises. Automation and Fluid Power Expertise since 1983.